Just east of Execution Rocks, Western Sound, in 22.5 meters (74 feet) of water. YSI 6600 Sondes with water temperature, conductivity (salinity), dissolved oxygen. Surface sensor at approximately 1 meter (3 ft) deep; a mid-depth sensor and a bottom sensor. Wind speed and direction, barometric pressure, relative humidity, air temperature from R.M. 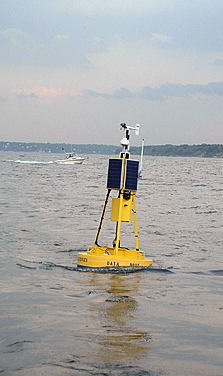 Young Co.
Anemometer height is 3.5 meters above the water surface. RDI 600 kHz acoustic Doppler current meter.